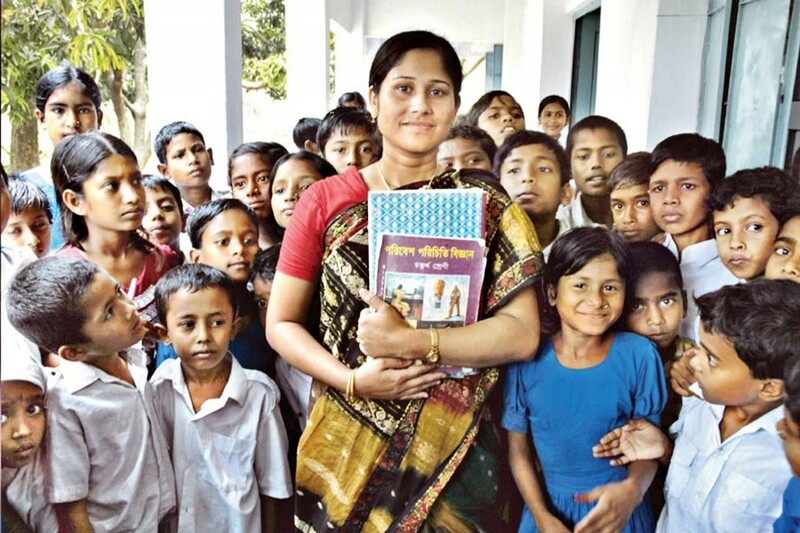 Bangladesh has seen a significant improvement in secondary school participation over the last two decades- thanks to the many government policies and NGO-led initiatives. In particular, policies and initiatives targeting female education have led to gender parity in enrolment and completion rates. Despite these achievements, students' learning level is poor and dropout rates at the secondary level remain high. According to a BANBEIS report, in 2015, two out of five children dropped out of secondary schools before they completed grade 10, and one out of five children left schools in grade eight alone. The situation is worse in rural areas. More than half the rural secondary school students do not complete grade 10. Most of them are from economically disadvantaged families. Parents of many of these children are unable to help with their school work at home and also cannot afford private tutors when these children struggle academically. To improve the educational outcomes of disadvantaged secondary school students in rural Bangladesh, BRAC initiated the Chhatrabandhu (CB) Programme in 2007 to provide these students with free after-school tutoring services through the help of volunteers. Volunteering is a noble cause and in many countries, between approximately a quarter and a half of the adult population volunteer their time without pay to help organisations deliver services to individuals and communities. Many people engage in volunteering activities, such as helping individuals and communities through religious services, helping flood-affected victims, educating children through free private tutoring, engaging in club or local level organisational activities, blood donation, etc. According to a BBS report in 2011 the value of the volunteering hours accounts for close to 1.7 percent of gross domestic product (GDP) in Bangladesh. This figure is comparable with the figures in the U.S. (2.0 per cent of GDP) and Australia (1.0 per cent of GDP). Working with local non-government schools, the CB programme recruits and assigns local educated individuals who are willing to volunteer their time and effort to provide after-school tutoring to underprivileged secondary school students in the subjects of mathematics and English over a two-year period. These volunteer tutors are revered as "social philanthropist" for their extraordinary service to the community and are called Chhatrabandhu - friends of the students. The typical CBs are local youths who live in the same village as the students, have completed their secondary education (i.e., passed grade 10 public national exam), and are either currently studying, working part-time, or unemployed. Most of them have had some experience in tutoring or teaching children in their own villages. The tutoring services they provide are expected to considerably improve the students' achievement in the Junior School Certificate (JSC) examination and Secondary School Certificate (SSC) examination. Over the years, the programme has been expanded to 55 districts involving more than 1400 schools and 40,000 volunteers throughout the country. One major issue regarding the voluntary sector is that volunteers tend not to stay long with the organisations for which they volunteer. For example, in the United States, one third of volunteers in 2005 did not continue their work in 2006. Ensuring the retention and performance of volunteers is always a challenge for organisations who heavily rely on volunteer service. Governments and organisations understandably employ various strategies to encourage volunteerism. One popular strategy to attract and retain the volunteers is to use awards, certificates, and public recognition to help retain effective volunteers. Although widely recommended, there is a lack of experimental evidence in the field regarding the impact of public-recognition rewards on the retention and performance of volunteers. To examine whether the use of non-financial incentives such as public recognition improves the retention and performance of volunteers, we conducted a natural field experiment involving the CB programme of BRAC. Our study involves more than 4000 CBs providing free after-school tutoring services in mathematics and English to more than 5,000 underprivileged secondary students in about 500 schools across 55 districts in Bangladesh. Under our experiment, we randomly assigned the CBs dividing them into three groups. CBs in the first group were offered a certificate of excellence ("superior certificate") in a public ceremony at the end of the two-year programme if their students experienced achievement gain. If their students did not experience any achievement gain, these CBs were awarded a regular certificate of appreciation. CBs in the second group were offered the same types of certificates, but the certificates would be provided privately rather than in a public ceremony. CBs in the third group would only receive the regular certificate of appreciation, irrespective of their students' performance. All the CBs received formal letters explaining the incentives they were offered at the beginning of the study in 2015, but they were unaware of the types of certificates offered to other groups. To study the impact of the different incentives, we collected information about the dropout status of CBs and we conducted standardised tests among the students of CBs and also collected information about the students' performance in JSC. Interestingly, our findings suggest that offering the performance-based public-recognition certificate increases the dropout rate of volunteer tutors by 21 per cent, but that offering the performance-based private-recognition certificate does not. Instead of improving retention of volunteers, the incentives backfire. How a volunteer would respond to a certain incentive crucially depends on his motivations for joining the programme. For example, some volunteers may engage in volunteering activities because they are altruistic (e.g., generous, and concerned for the welfare of others), while some others may engage in volunteering activities because they are using the opportunity to improve their career. Volunteers may also engage in volunteering activities because they want to 'show' to their community that they are public-spirited and altruistic. The public-recognition award may backfire the retention of an image-concerned volunteer if the volunteer is worried that her motive to help others being misperceived as her desire for rewards, fame, or public recognition. To avoid being misperceived as reward seeking, fame seeking, or shallow, volunteers who are highly motivated by unselfishness and generosity drop out of the programme. Although dropout rates increase among the volunteers, we find that academic performance of students improves as a result of the performance-contingent public-recognition certificate award, on average. The reason is that volunteer tutors who remained in the programme, especially those who have low altruistic motive for volunteering are incentivised to perform as the programme increases the visibility of their participation and performance. What our research shows is that using the public-recognition award to incentivise volunteers may attract volunteers who are not necessarily motivated by altruism, but if the incentive is useful for their career progression, it may help improve the performance of those who sign up for the volunteer programme. Sakiba Tasneem is a post-doctoral research fellow at Monash Business School.